"I’d like to watch 3D movies at home, but I don’t want to spend a lot of money on purchasing a 3D TV and 3D movies. I’ve heard that there is some kind of 2D to 3D converter software that could convert 2D to 3D video. Is it true? Where can I get such 2D to 3D video converter software?" Nowadays, most advanced 3D TVs own the ability to automatically add 3D effect for 2D movie sources so people could watch 3D movies at home. This greatly improves movie experience. However, it costs people a lot of money to purchase a 3D TV with 2D to 3D converter built in. Turning to a 2D to 3D conversion software program would be a wonderful solution. 2D to 3D software could easily convert 2D to 3D with original video quality retained. This guide offers 3 different 2D to 3D converter software to help you get all kinds of 2D movies into 3D. If you have some 2D video files and plan to convert 2D video to 3D movies, you could make use this part, which shows detailed solution on how to convert 2D movie to 3D with 2D to 3D video converter software – Leawo Video Converter. 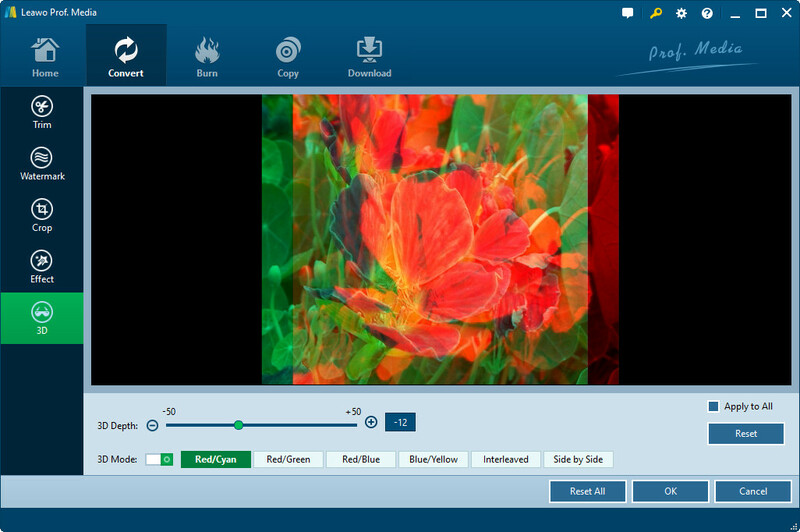 Leawo Video Converter, a built-in module of Leawo’s Total Media Converter Ultimate, offers easy to use and fast 2D to 3D conversion with 6 different 3D effects available: Red/Cyan, Red/Green, Red/Blue, Blue/Yellow, Interleaved, Side by Side. No matter which formats your 2D movies are packed and which formats you want to save the output 3D movies, Leawo Video Converter meets your needs with 180+ 2D and 3D formats supported. 1. 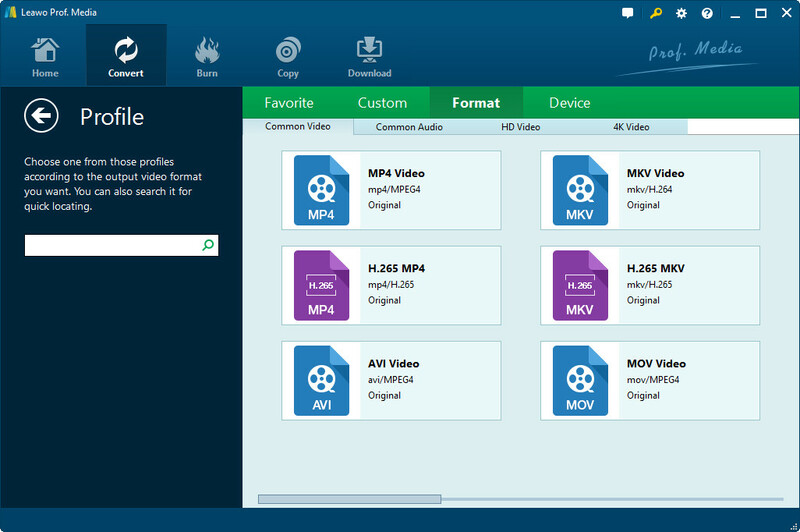 Convert 2D video to 3D between any format, like M4V, MP4, AVI, FLV, MKV, MOV, etc. 4. Edit source iPad video files like adding signature, changing video effect, rotating videos, adding 3D effect, etc. 1. 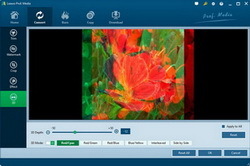 Drag source 2D videos into this 2D to 3D video covnerter, or click "Add Video" button to browse and add 2D videos. You could play back loaded videos, select subtitle and audio tracks, etc. 2. Right click the entered video and then click "Edit" option. Open the "3D" tab to set 3D effect. Adjust 3D Depth if neccessary. Click "OK" button to save and exit. 3. Click the drop-down box before the big green "Convert" button and then select "Change" option to enter Profile panel. Select output profile here. Click "OK" to save and exit. 4. Click the big green "Convert" button and then set output directory in the "Save to" option on the popup sidebar. 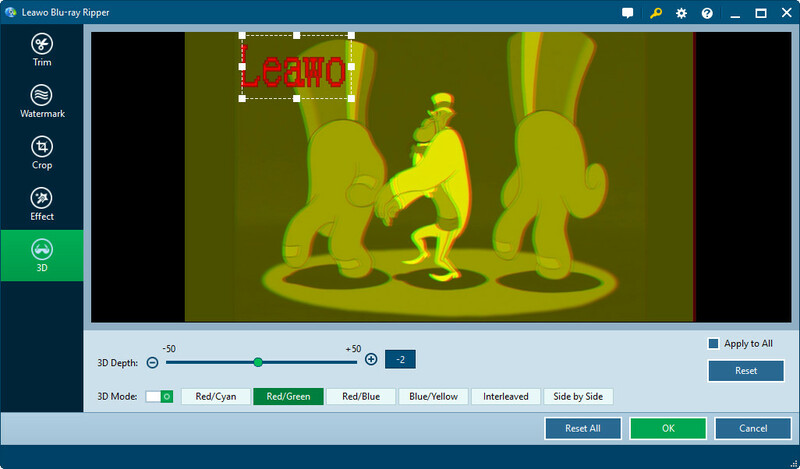 Click the "Convert" button to start converting 2D video to 3D. If you happen to have some 2D videos and plan to convert 2D video to 3D Blu-ray/DVD disc, this part offers you satisfactory answer. What you need to prepare include: source 2D movies, blank writable Blu-ray/DVD disc, Blu-ray/DVD recorder drive and 2D video to 3D Blu-ray/DVD converter software. As to the 2D to 3D converter software, Leawo Blu-ray Creator offers you the best 2D to 3D conversion assistance. No matter you’re going to convert 2D video to 3D Blu-ray or DVD disc, Leawo Blu-ray Creator could finish the work excellently. 2. 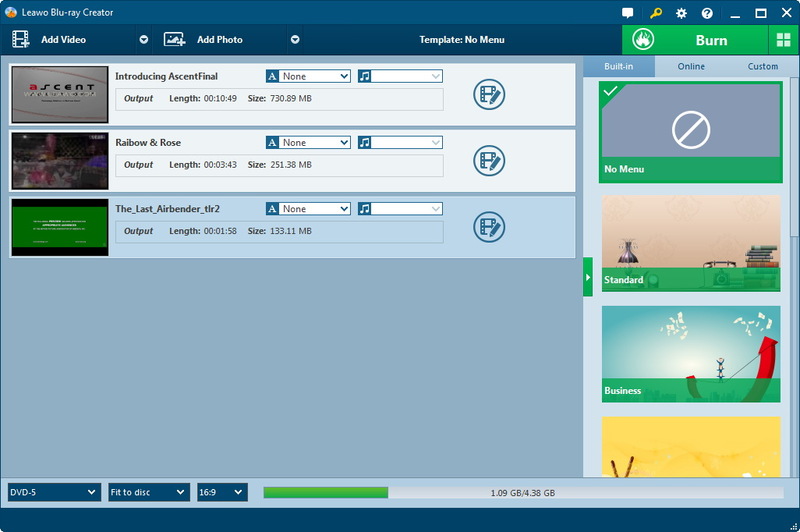 Add and edit disc menu by adding background music/image/video, changing title position, text color, font, etc. 3. 6 different 3D effects available: Red/Cyan, Red/Green, Red/Blue, Blue/Yellow, Interleaved, Side by Side. 3D Depth is adjustable. 1. Click the "Add Video" buttun to browse and add source 2D videos. Insert target blank writable disc into recorder drive. Set disc type (according to the disc inserted to the drive), quality and aspect ration at the bottom. 2. Right click the loaded video and then choose "Edit", or directly click the "Edit" icon in the video title. Open the "3D" tab, enable "3D Mode", then select a 3D effect and set 3D depth. Click the "OK" button. 4. Click the big green "Burn" button to set "Burn to", "Disc Label" and "Save to" options. Click the top-right wheel icon for program settings. 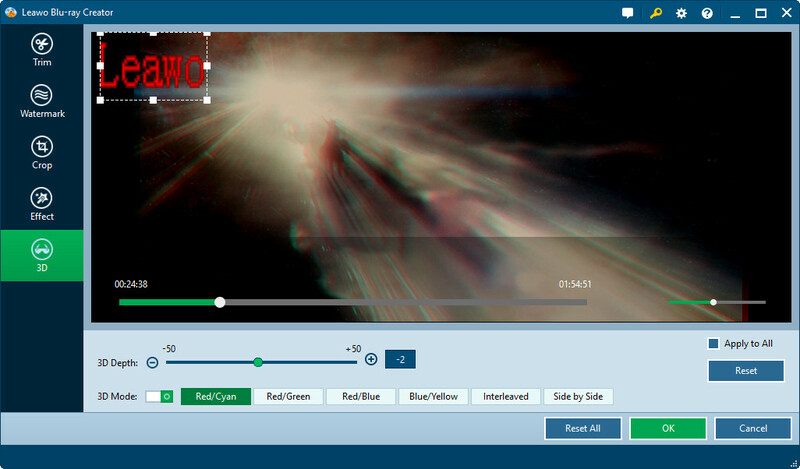 Finally, click the bottom "Burn" button to start 2D video to 3D Blu-ray/DVD burning. 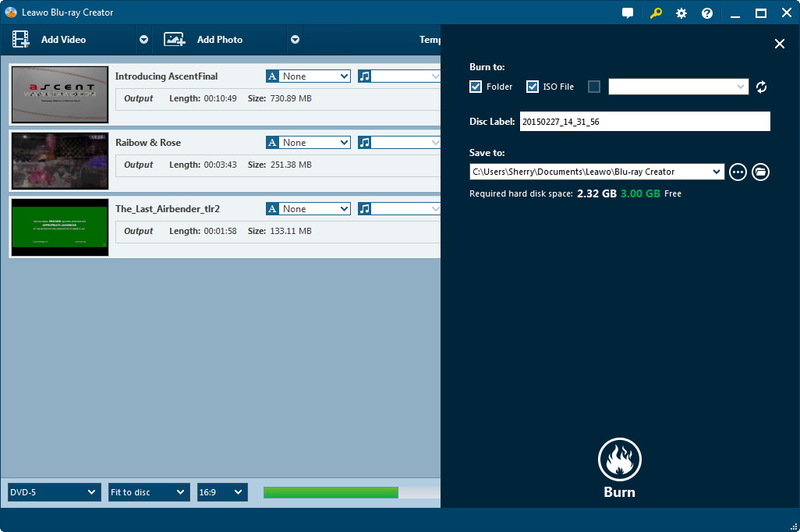 To burn 2D video to 3D Blu-ray/DVD disc, insert a blank writable Blu-ray/DVD disc into the recorder drive first, set output disc type according to the inserted disc, set the insert disc as target under "Burn to" option. Another way to get 3D movies is to rip and convert Blu-ray/DVD movies to 3D videos. As we all know, Blu-ray and DVD are the most common carriers of HD movies, and also the most popular movie sources you could get from the market. The only thing you need to worry about is a good 2D to 3D video converter that could decrypt, rip and convert 2D Blu-ray/DVD to 3D videos in different formats. Leawo Blu-ray Ripper is your best choice for ripping and converting Blu-ray/DVD to 3D videos. With a 2D to 3D converter built in, Leawo Blu-ray Ripper could easily decrypt and rip Blu-ray/DVD movies, allow you to add 3D movie effect as you like, enable you to select output 3D video format easily for different 3D players. 1. 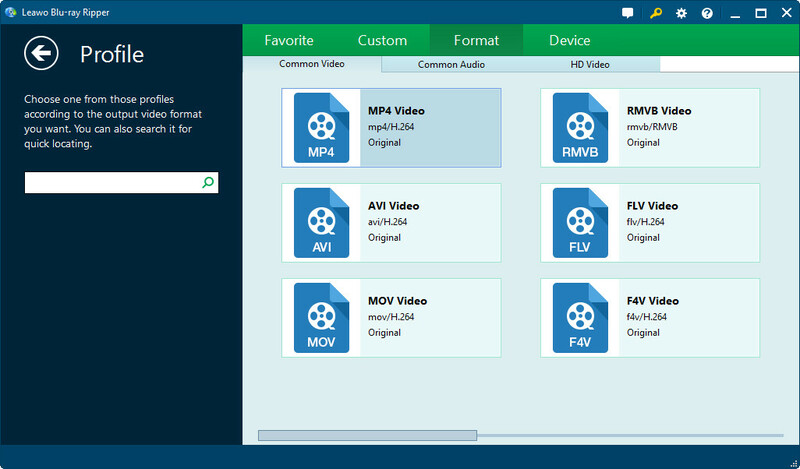 Decrypt, rip and convert any Blu-rya/DVD file to video in 180+ formats like M4V, MP4, AVI, FLV, etc., regardless of disc protection and region code. 2. Set output 3D video format and edit video and audio parameters freely, like video codec, bit rate, aspect ratio, audio codec, resolution, quality, etc. 4. Edit source video files like adding image or text watermark, trimming video length, cropping video size, changing video effect, rotating videos, etc. 1. Click the "Add Blu-ray/DVD" buttun to add source Blu-ray/DVD movies. To convert Blu-ray/DVD disc to 3D video, insert the source disc into the recorder drive first. 2. Click the drop-down box before the big green "Convert" button and then choose "Change" option to enter Profile panel, where you need to set an output profile. 3. Click the "Edit" icon in the loaded Blu-ray/DVD title (or right click it and then select "Edit" option). Move to and click "3D" tab and enable "3D Mode" to set 3D effect. 4. Click the big green "Convert" button after returning to the main interface. Set output directory and then click the "Convert" button at the bottom to start 2D to 3D video conversion. In Step 2, you could change the video and audio parameters of output profile by clicking the drop-down box and then opening "Edit" option. You could set video codec, bit rate, aspect ratio,frame rate, resolution, quality, audio codec, etc. Leawo Blu-ray Ripper could remove disc protection and region code upon personal discs for personal use, but requires Internet connection.